Attack on Titan 2 Coming to Nintendo Switch | Nerd Much? We should all keep in mind that the Switch has no region locking. Attack on Titan 2 was announced back in August and at last week’s Tokyo Game Show, developers Koei Tecmo gave a few details on the game. For example, gameplay details and the systems the game will launch on, being the PS4, PS Vita, and PC. Today however, it has been confirmed that an American version of Attack on Titan 2 will be coming to Nintendo Switch as well. There is no release date for the game yet, save for early 2018 in Japan – no international release date though. That said, we should all keep in mind that the Switch has no region locking. So if you buy a game from Japan, you can totally play it with your American bought Switch. You just might not be able to understand what anyone is saying or read the game directions. Not a big deal for most fans, who are sure to have a translator on hand. Otherwise, you’ll have to wait for the international version to come out to really make sure you know what happens to your favourite characters. Or watch the second season of the anime, as the game sequel is based on the events that occurred there. Though there is a section of the game that is completely unknown and the developers are working with the creator of the series to ensure its authenticity. According to the game’s website, there are plenty of original characters to meet in the game. 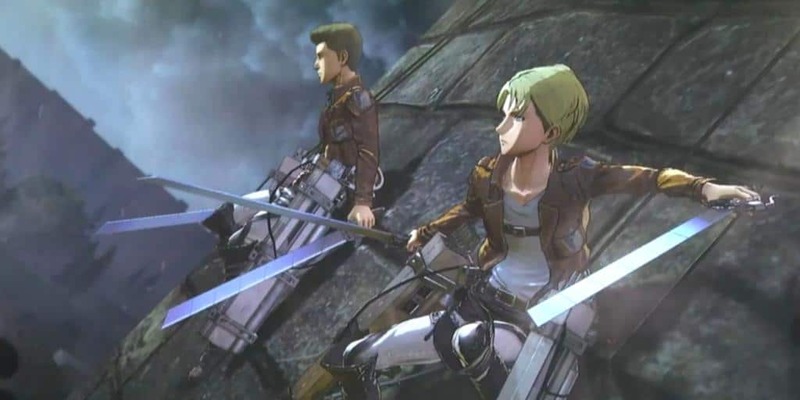 Attack on Titan 2 will also feature more playable characters than ever before, though a specific number was not mentioned. Combat for the new game has been revamped, especially the Titans themselves and the 3D Maneuver Gear actions. Most importantly, you can “run around in the air freely” through a special command of buttons. Koei Tecmo also state that they have focused a great deal on making sure the combat is as fluid and exciting as it is in the anime.